Houston, we have a problem. Hillary Clinton's campaign has run into a major speed bump and it's called Bernie Sanders. As we move toward the day of reckoning known as Super Tuesday, she's dialing up Black America to answer the call to action. The woman that was supposedly married to America's first black president is now hoping that it is Black America that buoys her campaign. The problem is that regardless of whether Bill Clinton believes, as he has recently stated, that"we are all mixed-race people...", he is white and the Clintons were far from good for Black America in their last go around in the White House. Whether we look at "The Violent Crime Control and Law Enforcement Act " signed by President Clinton in 1994, a piece of legislation which led to more black men being incarcerated than we had seen in all of America's dark history, which is saying a lot. Or, the Telecommunications Act of 1996 which nearly gutted black media ownership by removing caps on corporate media ownership. The Clinton era was marked by a reality of setbacks for African Americans that are too often understated, and are best summed up by Michelle Alexander, author of the bestseller "The New Jim Crow". 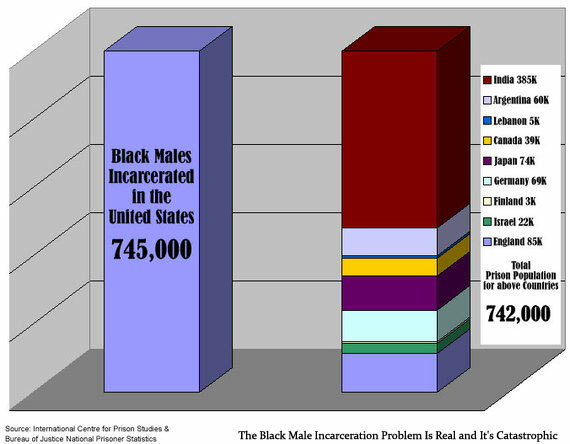 "... there are currently more African American men incarcerated in the U.S. than the total prison populations in India, Argentina, Canada, Lebanon, Japan, Germany, Finland, Israel and England combined. India alone is a country of 1.2 Billion people, the country in total only has around 380,000 prisoners." Recently Bill Clinton admitted regret for his part in the incarceration increase stating, "... the president spoke a long time and very well on criminal justice reform,..But I want to say a few words about it. Because I signed a bill that made the problem worse and I want to admit it." But his words do little to correct the effects his legislative pen had on millions of black families. This is covered extensively in the documentary I served as a producer on "Freeway: Crack In The System", which details how lawmakers racialized the punishment of non-violent crimes, and the devastating impact that approach had on black homes across the nation. The increase in gangs and drugs that we covered in our film, resulted in Hillary Clinton calling those convicted 'super-predators', and stating they needed to be brought to heel. An action often reserved for breaking an animal, rather than rehabilitating human beings. The problem was they were not super, nor predators, they were just a generation of misguided young black men. In actuality they were brothers, fathers and sons caught in a webbing of economics that was 30 years in the making, one that dated back to a time when President Nixon formally declared a "war on drugs". This entanglement closed in on them as cheap drugs became available, and cities across the nation lost manufacturing jobs leaving employment deserts in urban ghettos. Following her earlier statement, Michelle Alexander wrote a scathing critique, being highly critical of Hillary Clinton receiving support from Black America. In it she details the reasons why Hillary should not get Black America's vote, and calls on African Americans to take on a deeper review of the Clintons' policy history. Bill Clinton was the standard-bearer for the New Democrats, a group that firmly believed the only way to win back the millions of white voters in the South who had defected to the Republican Party was to adopt the right-wing narrative that black communities ought to be disciplined with harsh punishment rather than coddled with welfare... Clinton mastered the art of sending mixed cultural messages, appealing to African Americans by belting out "Lift Every Voice and Sing" in black churches, while at the same time signaling to poor and working-class whites that he was willing to be tougher on black communities than Republicans had been... An oft-repeated myth about the Clinton administration is that although it was overly tough on crime back in the 1990s, at least its policies were good for the economy and for black unemployment rates. 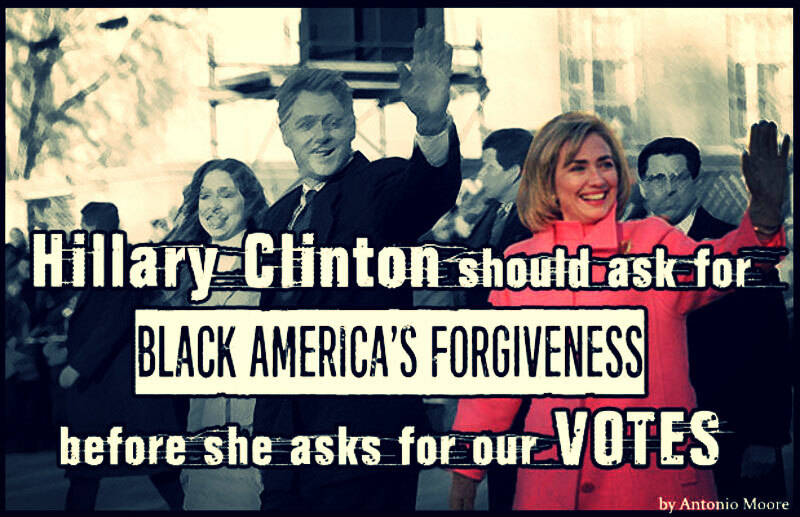 Hillary Clinton's backing from blacks should not be a given, it should be a question mark given the very questionable past the Clintons have with Black America. As stated by Shaun King of the #BlackLivesMatter movement, "The idea of an African-American firewall for Hillary Clinton is deeply insulting." For those that conveniently try to separate Bill Clinton's time in the oval office from Hillary, no matter how you slice it Hillary Clinton's campaign is indelibly intertwined with Bill's administration. It is undeniable her record of preparedness for the White House is based in large part on his presidency. Focusing in on the economy, the Clinton era is remembered as a great time for America, a time when everyone prospered. But so often what is forgotten is a detail of how at least in part all those supposed good times occurred. The prosperity everyone remembers was short lived, and it lacked sound fundamentals to sustain itself. As an example, in 1999 President Bill Clinton signed the Financial Services Modernization Act, effectively repealing Glass Steagall the law that separated commercial banks and investment banks. Many economist credit Bill Clinton signing this legislation with the creation of the sub-prime mortgage crisis. A financial catastrophe, which particularly ended up targeting so many Latino and African American families across the nation. During the last two decades, the large-scale use of incarceration to solve social problems has combined with the fall-out of globalization to produce an ominous trend: prisons have become a "growth industry" in rural America. Communities suffering from declines in farming, mining, timber-work and manufacturing are now begging for prisons to be built in their backyards. The economic restructuring that began in the troubled decade of the 1980s has had dramatic social and economic consequences for rural communities and small towns. Together the farm crises, factory closings, corporate downsizing, shift to service sector employment and the substitution of major regional and national chains for local, main-street businesses have triggered profound change in these areas. The acquisition of prisons as a conscious economic development strategy for depressed rural communities and small towns in the United States has become widespread. Hundreds of small rural towns and several whole regions have become dependent on an industry which itself is dependent on the continuation of crime-producing conditions. The incarceration of young blacks is part of the reason the unemployment numbers fell under the Clintons. Effectively by incarcerating young black men they became an invisible population and no longer counted as unemployed, despite still being jobless behind bars. In addition, through their imprisonment jobs were created for officers, judges, prison guards and the like, in communities across the country. It is not enough to say Black America faces problems; the Clintons must go further and take responsibility for playing a role in planting part of those problems' roots. The great irony of her speech came when she referenced second chances for convicts stating, "... in my faith we believe in second chances, in America we believe in second chances. Let's give those chances to people who need them the most." If we take full stock of the lasting effects that resulted from the legislative policies enacted by the Clintons, we are ultimately lead to the question, why should we give you a second chance in the White House? Antonio Moore is a Los Angeles Attorney. He is also one of the producers of the documentary on the Iran Contra, Crack Cocaine Epidemic and the resulting issues of Mass Incarceration "Freeway: Crack in the System". Mr. Moore has contributed pieces to Huffington Post, Inequality.org and thegrio on topics of race, mass incarceration, and economics.